Local residents had appealed for help after being harassed and "taxed" by Islamist fighters. The Egyptian army stormed the town of Dalga in central Egypt, 190 miles south of the capital Cairo, which has been controlled by Islamist radicals for more than two months. Islamists seized the town as part of a backlash against the military-backed ouster of Muslim Brotherhood president Mohammed Morsi. Twice the army attempted to retake the town, but the heavily-armed Islamists managed to repel their advance on both occasions. However, following repeated appeals for help by the town's residents - in particular its Coptic Christian population - the army successfully retook the town on Monday. This time, according to eye-witnesses, there was little to no resistance from local Islamists, as a sizable force of soldiers and police moved in, backed by military helicopters. Approximately 20,000 of the town's 120,000 residents are members of the Coptic Christian community, an ancient community which predates the Arab invasion and spread of Islam in northern Africa. Copts make up around 10% of the Egyptian population, and have long complained of discrimination. Since the ouster of Morsi, his Islamist supporters have escalated a campaign of extreme violence against Egypt's Christian community - essentially scapegoating them for their loss of power to the largely secular military-backed interim government. Christians throughout the country have been targeted. Churches, schools, homes and business belonging to Christians have been torched and looted; Christians have been beaten and lynched and, in a few extreme cases, gunned down and even beheaded by radical Islamists. 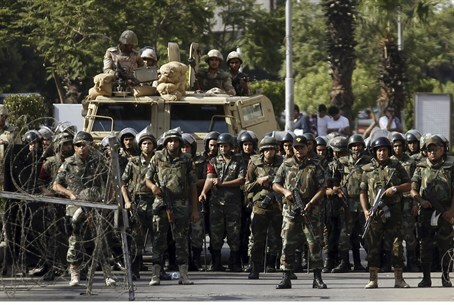 The media spotlight has largely focused on clashes between pro-Islamist protesters and security forces in Egypt's major cities - paticularly Cairo - and on the military's ongoing battle to wrest back control of the lawless Sinai Peninsula, which borders Israel, from Islamist groups. However, a number of towns in central Egypt had also fallen to Islamist extremists, with Dalga suffering more than others, according to reports. Ancient churches were sacked, and archaeological treasures were looted as armed Islamist thugs set about terrorizing and humiliating the local Christian population. Following the army's success in retaking the town Father Ayoub Youssef, the patron of the Catholic Mar Guirguis Church, told the BBC that Christian families were "relieved" but said that he was still concerned. Meanwhile on Monday, at least nine Egyptian police recruits were injured in a bomb attack on their convoy in the Sinai Peninsula. The attack occurred near the town of Rafah, which borders the Hamas-controlled Gaza Strip. On Sunday, the Sinai-based Ansar Jerusalem terrorist group released a statement accusing Egyptian forces in the Sinai of carrying out a "massacre" of at least seven civilians, including four children. According to The Long War Journal the Islamist group promised a "painful" response and published a number of photos it claimed were from the site of the "massacre" on September 13th. "We in Ansar Jerusalem and all the mujahideen in Sinai and Egypt stress that the blood of the innocent Muslims will not be wasted," read the statement, which was translated by the SITE Intelligence Group.